The picture of my husband and I posing on top of Mt. Titlis like Leonardo and Kate from the movie Titanic, adorned my desk. That was our fifth wedding anniversary way back in 1997. Now after almost twenty three years of marriage, I wish to change that picture from the frame. But somehow I am not able to choose that ‘one’ photo from the stack of all the photographs to replace the same. It’s not the babies crying in the adjacent room which is disturbing me; also not the constant banging of the door behind me. It’s something to do with me, probably within me. Sometimes not knowing the problem itself seems to be a blessing in disguise than knowing the problem and not having a solution to it. In this confrontation with myself, I completely forgot how my staff, was meticulously planning my farewell. Having worked for so long, my fifteen staff members were family to me. They made me laugh whenever I was low and stood with me whenever I needed them the most. The hunt for the picture continued. The quest for the perfect picture to decorate my desk on the last day at my job made me more restless. Sipping the coffee made me little calm. Opening the door, one of my staff came in. “Doctor, your needed. The patient is in labor”, she said. I rushed to the Emergency Room. The patient was in excruciating pain. Though I may have never experienced her agony and suffering, but the anxiety of being a mother is something which I have yearned for a very long time. The patient was transferred to the Operation Theater. The delivery was successful and I handed over the little girl to her mother. The tears running down the mother’s eyes and the girl’s first cry made me feel happy. But the happiness was empty. It wasn’t because it was my last day at work but because I could never undergo and feel the same joy which my numerous patients over the years experienced. As I returned, to clear my room and bid a final goodbye, the picture from the photo frame on my desk was missing. Instead there was a gift, beautifully wrapped on my desk. Opening it, I saw a lovely collage of the photographs of all the babies that I delivered over these years in this very hospital, neatly arranged around the same photo from that old frame. The quest for the perfect photo had ended and my family too was complete. Posted in Desire, Doctor, Family, Gift, Longing, Mother-Child, Photo, Yearning.Tagged Desire, Doctor, Family, Gift, Longing, Mother-Child, Photo. A perfect feel of a sense of fulfillment. For the author who is so young it is a great writing. For the reader it was an interesting and a touching anecdote. Thank You so much. It really means a lot when one gets this kind of encouragement and support from his readers. Thanks for your appreciation. It is very sweet to know that u were eagerly waiting for the new post. I am glad to know, that you liked it. Hi. Nice thoughts. I really liked the line “Sometimes not knowing the problem itself seems to be a blessing in disguise than knowing the problem and not having a solution to it.” Very true. I am sure most of us would have gone through this dilemma in our lives; which not only tests us but also teaches us simple yet great facets of LIFE. Thank You Manijeh for your wonderful comment. Wow what a thought. For a man in his 20’s imagining this and reproducing it so well in his beautifully crafted words is nothing but a price of art and gifted creativity. I doubt even people who actually do this act would have ever thought of anything like this. Congrats dear. God bless you. Thank You for your wonderful comment. It really means a lot. Salutes to the young mind which I believe is in his 20’s to have crafted those words of a man of 60’s with a kind of superlative imagination. Kudos!! To the Young Author. Age is just a number which makes us, humans, easy to differentiate one from other. But fortunately art and creativity doesn’t do it. Thanks for your kind words. Looking forward for your continued support. Dear Ameya, Great . Wonderfully written. Its well said that happiness is within ourself and what we do evrryday. But most of the times we are searching it outside. Amazing thoughts from a young author. Hats off to you. True. But, sometimes the longing and the desire for the happiness is so intense that even a balanced person becomes restless. Hoping everyone gets their share of happiness, which they have yearned for. Stories that tug at your heart.Proud of you.Looks like you found your calling ! Nurture it and keep going! Look forward to many more soulful write-ups. Thanks a lot for your kind words. I am glad the stories could touch your heart and could connect you emotionally. Wonderful writing ability in such a younger age and most beautiful part is selection of words. I have read all your blogs and found all very touching and close to daily routine life of common man. All the best for great future ahead. Firstly I would like to Thank You from bottom of my heart for having read every post and appreciating it generously. I have always believed great stories come out from our daily routines and common man is the biggest protagonist of it. Hence it has always been a conscious decision to connect the readers with various emotions of LIFE through the story of a common man. Thank You so much my dear sis for your appreciation and good wishes. Love you always. 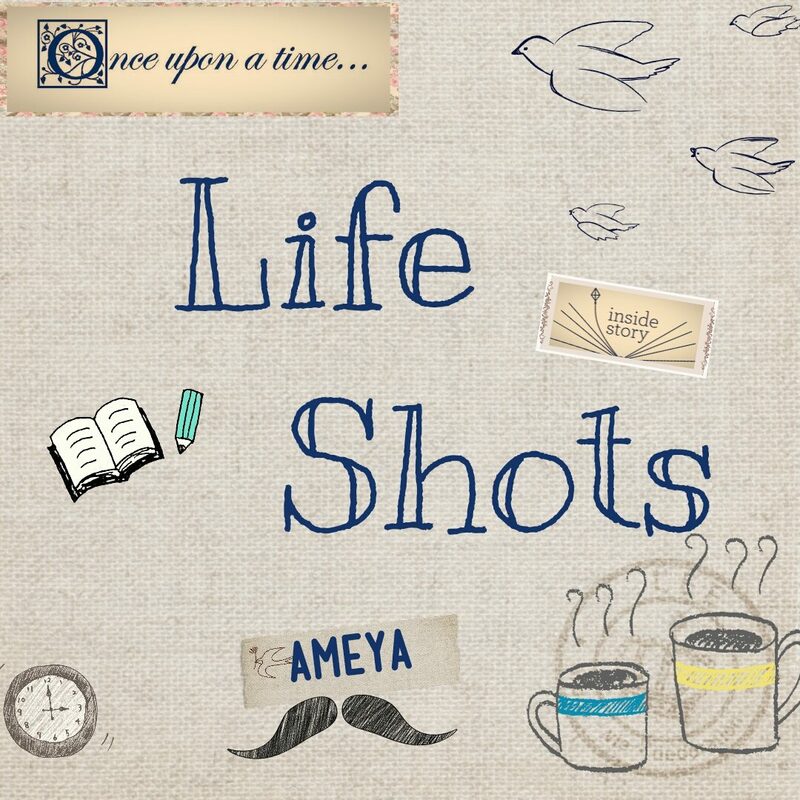 Hey Ameya a very touching blog. I like ur way of writing about our day to day stories. Keep it up. Thank You so much. I am glad you liked the theme of the blog. Its a sincere effort to showcase the different emotions of LIFE through simple stories. Thanks once again. Thanks Ancy! You have indeed pressed on a very important point, reflecting from the story. The underlying fact of the story is the ‘acceptance of the reality’ by the protagonist who finally made truce with herself, with her destiny and found peace in seeing the joy in others which she was a part of. Thanks for such a wonderful summarization, Ancy. Very well said!! Kudos Ameya! Such mature writing !!! So touching ! Waiting to read your next article. Thank You so much Lakshmi. More than appreciation what drives an author, is the readers acceptance of his work, acknowledgement of the emotional connect through his narrative and anticipation from his next work. HI Ameya, Oh i have liked your story .actually the suspense in the story is very interesting.Never expected that the story will end like this.Amazing!!! Keep writing such interesting stories henceforth also.God Bless You. All the Best Wishes To YOU. Thank You so much for your kind words and good wishes. I am extremely happy to know that you enjoyed reading the post. Thanks once again.